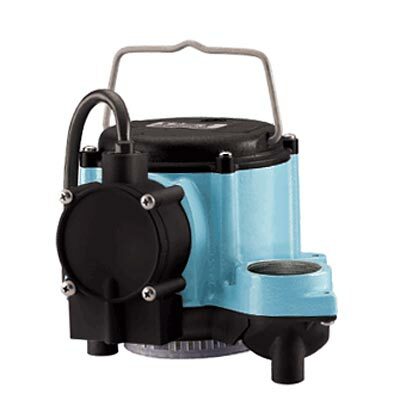 Remove standing water from your basement, sump pit, or pond using the Little Giant Automatic Utility Pump. This versatile item effectively relocates water from a flooded room or your sump basin, to keep your home safe and dry. The item may be completely submerged, and its screened inlet protects the motor from debris. The dielectric oil within the unit keeps all bearings lubricated, ensuring a watertight and lasting design. Its durable, cast iron housing has an epoxy coating for rust and corrosion resistance, and the attached metal handle makes repositioning simple. The 1 1/2" FNPT outlet allows you to move plenty of water, while an included 1 1/4" adapter offers versatility in tubing size. The automatic shut off switch protects the 1/3 horsepower motor from running dry. Recirculate or transfer water easily using this Automatic Utility Pump. Two year limited warranty.